A New Web Page or Blog Entry dialog box will appear. 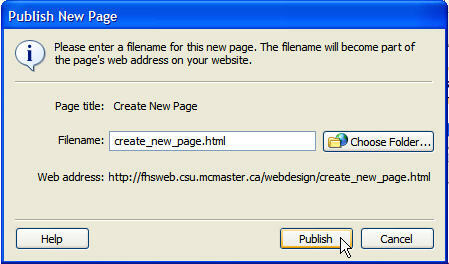 Under the website in which you are creating the page, a list of templates will appear under the Templates folder. Select the template you want to use for the page. A sample will appear in the preview pane so that you will be able to see how the page will appear. In this example, format 1.1 (format1_1) has been chosen. 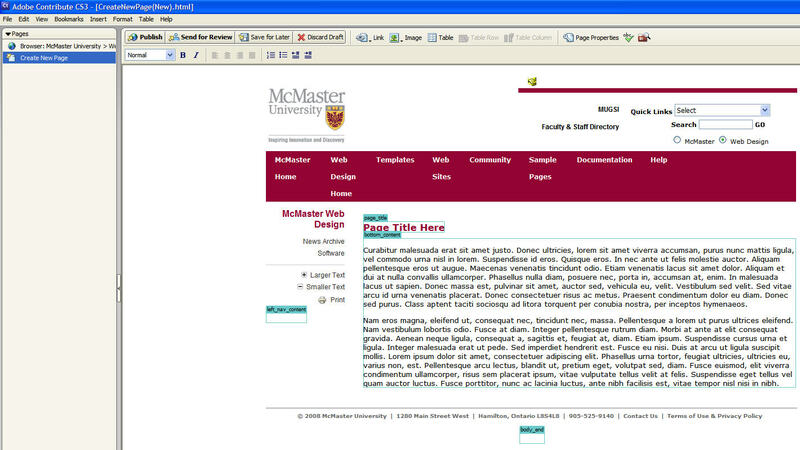 NOTE:	Do NOT select the mcmaster template when creating pages. This is the master templates from which all the other templates are created and contain no formatting in the content area. You should choose the format1_1 template instead. Enter a Page title in the text box on the bottom right of the dialog box. This is the text that will appear in the title bar at the top of the browser window. If a visitor adds your page to their favourites (bookmarks), the page title is the default name it will give the bookmark. Search engines use the page title as the listing name for their results. In HTML the page title is delimited by the <title>page title</title> tag. You should keep the text of the page title as brief as possible. NOTE: Do not enter the file name for the page here. Enter readable text. Contribute will use this text without spaces only as a suggestion for a file name when you publish the new page, but this is not the place to enter the file name. Blue boxes indicate where you may enter content for the page. Each box has a name that appears above it on the top left. Dummy content has been placed into the boxes as placeholders so that you will have a better idea of how the page will appear. You will replace the dummy content with your content. 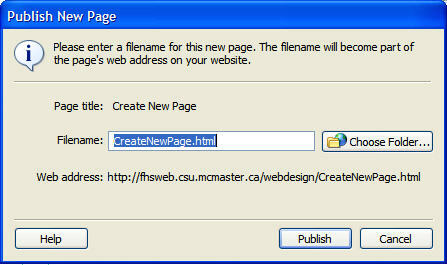 Select the dummy text in the blue box with the name "page_title". Enter the content title you want to appear at the top of the page content. (This title is not the same as the page title you entered when you created the page.) In HTML the text in this box will be delimited inside of the <h1>Title of Content</h1> tag. When search engines index the page, they will look for the <h1> tag as an important resourse to discover what the page is about. You should not use <h1> tags anywhere else on the page. You should use <h2>, <h3>, <h4>, etc instead. After you have updated the content on the page, you can test how the page will look in your browser by hitting F12 key (or selecting File -> Preview in Browser from the Contribute menu). You may check the spelling on the page by clicking the spelling icon on the Contribute toolbar.